CREW Upstate | Check out our ad in the Upstate Business Journal! Check out our ad in the Upstate Business Journal! 04 Aug Check out our ad in the Upstate Business Journal! CREW Upstate thanks our sponsors in this week’s Upstate Business Journal. 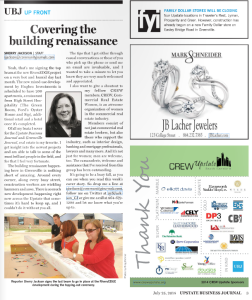 Also featured is an article, “Covering the building Upstate shout out Sherry!